Once you have created an SLA, the next step is to select which Ticket Type would like to use. Selecting a Ticket Type is useful as different ticket types may have different SLA requirements. For example, a “Feature Request” might allow for a longer response times than a “Bug” or an “Issue”. SLA Name: This value cannot be changed from this screen. It is based on the selection that you made on the previous window (see above). Ticket Type: This value cannot be changed from this screen. It is based on the selection that you made on the previous window (see above). Ticket Severity: The SLA is also defined against each severity so that a “Critical” ticket severity has a different, and more stringent SLA than a “Minor” ticket. Warning Time before Violation: You can define when the warning time kicks in before each Violation. A ticket in warning state has color coding and notifications (see below). 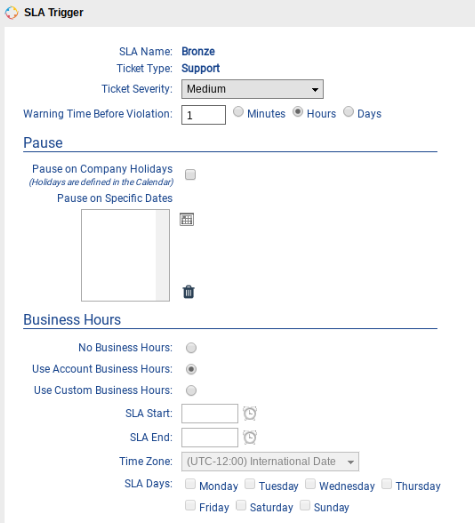 Pause on Company Holidays: You have the option to “pause”, or stop calculating time against your SLA’s on Company Holidays. These Holidays are defined in your TeamSupport Calendar. Holidays are defined as an entire day. If you choose to pause on Company Holidays, your SLA’s will resume counting on the following day where it left off. No Business Hours: If your SLA should operate independent of your business hours use this default selection. This means your SLA times will be calculated during off peak times like overnight and the weekends. Use Account Business Hours: You can setup your Business Hours in your My Company settings. If you check this box, your SLA rules will only apply during these defined business hours. Use Custom Business Hours: If you have Custom Business Hours that need to be defined that are separate from your Account Business Hours, you can define them here. A use case for this might be if you are defining business hours for an SLA that will apply in a different timezone. You can name this SLA for the area that it will apply to, for example “APAC – Bronze”, and then choose the appropriate timezone for the business hours. You have the following options for defining your custom Business Hours: SLA Start, SLA End, Timezone, and SLA Days (Monday – Sunday). The time since initial response: This defines how quickly you must take the first action on a ticket – Typically this is something as simple as an acknowledgment that the ticket has been received. The initial response is satisfied by a public action by default. However, there is a My Company admin setting that will allow private actions to also satisfy SLA first reponse. Time since last action: This defines the amount of time which can pass without any work being done on the ticket. In many cases, SLAs are defined for certain severities such that “continuous work” must be performed until resolution. In this case, a new public or private action would have to be added to the ticket by the user or the customer as the team worked to resolve the issue. You can also use this to highlight stale tickets by setting this value to a few weeks. Time until closed: Perhaps the most important metric that the customer cares about – How long do they have to wait until the issue has been resolved. Notification Options: Notifications of SLA warnings and violations are sent via Email and color coding is used on the user interface. Choose to whom notifications are sent to (users and/or groups) and when they are sent for warnings and violations. For example, for “High” severity Support tickets, you may want to send out emails for warnings and violations to assigned User and Group. However, for “Low” severity Feature Requests, you may only want to send out email notifications to assigned Users only for Violations only. Please Note: Group Notifications may be turned off on the User level. If a User has “Receive Unassigned or Assigned Group Notifications” set to “No”, they may not receive SLA notifications. Our SLA color scheme is Green = No SLA issues, Yellow = SLA Warning state, Red = SLA Violation state. Colored notifications on the user interface can be seen in all ticket grids and in the SLA section on the Ticket detail window.
! To finalize your SLA setup, you must assign your SLA for your Customer, Product, or both. Click here to learn how finalize your SLAs.